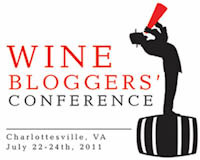 It’s hard to believe, but in about 30 hours I‘ll be hitting the road to Charlottesville on my way to the 4th Annual North American Wine Bloggers’ Conference. In preparation for joining some 300 other wine bloggers and industry folks, I’ve been thinking about how to approach posting about the conference. WBC09 was a lot of fun, but also a very overwhelming, and since it was my first WBC, I didn’t end up blogging as much as I would have liked. I imagine WBC11 will be just as fun and just as overwhelming, which is why I laid out a game plan for this year. Whether I stick to the plan still remains to be seen, particularly as it seems that my nighttime blogging time will be severely diminished by all of the “after-party” tastings, but there definitely is a plan. So, be sure to follow me on Twitter and check regularly highlights! I already started a WBC11 tag, and each post will have the WBC11 logo, so the posts should be easy to spot. Until then, I need to finish checking out the blogs of my fellow attendees (this way I know a little about each blog when I meet the blogger in question); I need to research a little more about the sponsors and wineries (this way I can ask specific questions and share some juicy details with you); and I need to compile a pre-conference to-do list (so that I arrive in C’ville with my camera batteries charged and the Gatorade I promised Shelby in order to ensure that we can stay hydrated as we brave the 100-degree weather and all that wine).